Emma Cross is an independent woman—more independent than anyone in 1897 Newport, Rhode Island, wants to admit. And yet as a cousin to the Vanderbilt clan, her role as a newspaperwoman is reluctantly accepted. 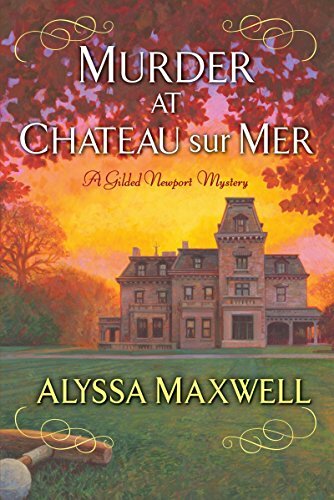 In Alyssa Maxwell’s new mystery, Murder at Chateau sur Mer, Emma Cross is covering the social side of a polo match when she overhears a conversation between three men discussing possible problems with Senator George Wetmore, but before she hears the outcome, a disturbance draws everyone’s attention when a young woman rushes onto the polo grounds insisting on meeting with Mrs. Wetmore. The young woman is escorted off the grounds with no further comment. The next morning, Emma is called to Chateau sur Mer, the Senator’s home, where the same young woman has been found murdered. Emma’s previous experience in solving crimes has not gone unnoticed, and the senator’s wife asks Emma to discreetly look into the matter. Lilah Buford, a local prostitute, has led a difficult life, and Emma quickly learns that determining a relationship between this young woman and a senator’s wife is a winding path indeed. It is a path not easily followed for a forward thinking woman in a man’s world as Emma continually swims upstream against the tide of men who are determined to protect her, even if she does not need protecting. Her two suitors, Jesse Whyte, Detective;,and Derrick Andrews, young scion of a wealthy Newport family, find it equally frustrating as they both help and hinder her in her goal. Emma’s quest leads her to Lilah’s place of employment by the docks, where she encounters two dockworkers, Jonas and Anthony. Anthony is a dishonored police detective who lost his job as a result of a previous investigation involving Emma, and on two occasions Jonas has had to come to Emma’s rescue from the hands of Anthony. Maxwell offers up an interesting group of suspects to round out the mystery. Stanford Whittaker, Robert Clarkson, Harry Lehr, and James Bennett, owner of the New York Herald newspaper. Each is upset with Senator Wetmore’s proposed Dingley Tariff, and each man, although members of the elite 400, is disreputable in his own way. There is the requisite other-side-of-the-tracks group of ladies who worked with Lilah and may also have their own reasons for seeing her out of the way. Add to this muddled group a mysterious family that shows up in Newport, anxious to step into the ranks of the 400—a very tight-knit group not easily accepting of outsiders. Emma’s search takes her from the seedier side of Newport to the most upscale of homes and businesses where she continues to gather small pieces of the puzzle, but the bigger question remains: Just what is the relationship between Mrs. Wetmore, a senator’s wife, and Lilah Buford, a prostitute? Emma’s investigation is not made any easier when she is fired from her newspaper job just as she is narrowing down her list of suspects and finds herself at the office of James Bennett, looking for a position with the New York Herald. As with all good mysteries, Maxwell ends hers with a tension-riddled fight scene where Emma uncovers the true perpetrator and puts all the pieces to this puzzle in order. The resolution to the mystery is logical and well plotted. Maxwell’s representation to the era in which she sets her story is well laid out and her writing style is in keeping with 19th century life: very proper. Her heroine, Emma Cross, stays within the bounds of what is right for a delicate lady—but just barely within the bounds. This is a fun book to read. It moves quickly and ends with a satisfying solution.